This year J got to experience Funland. 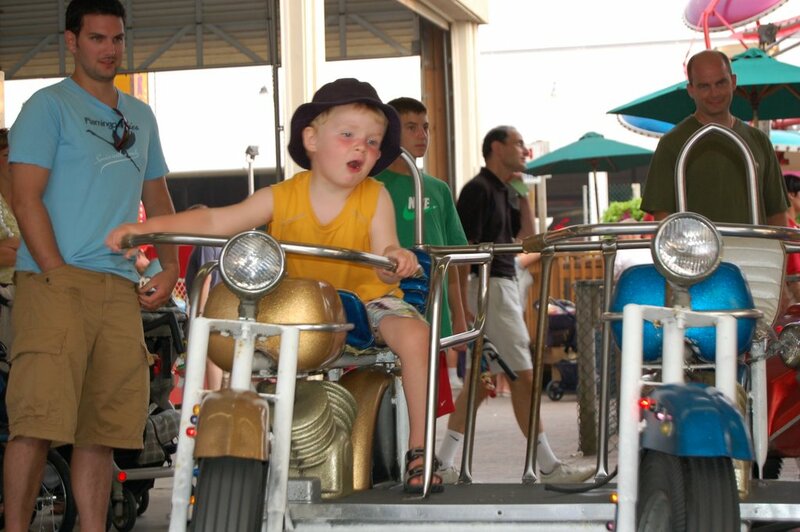 The last two summers he would cry if we even got close to it on the boardwalk. Funland is a mini amusement park, full of kiddie rides, adult rides and games. Growing up me and my Sisters, along with a handful of cousins, would burn through our allowance at Funland. There are stories of my younger Sister p--ing on her cousin on the tilt-a-whirl (which has been replaces with another ride). I have gone on the flying dragon just to impress my husband. Now that A finally was ready to go on the big rides again and J was on the little ones, I no longer have to subjet myself to the rides. I get motion sickness, but if I go at just the right time, I am ok.
J and J2 loved the rides and it was so great watching them go. My Sister and I had tears watching our kids ringing the bells on the fire engines, shooting each other on the fighter planes and watching J ride his first motorcycle. There were boats, a jeep train, flying swings, tea cups and a merry go round. We saved a few for next year, just for fun. Hubby won both J and J2 a puppy at the "Wack-a-Mole" that became quite a challenge and at one point five of my family members where up there whacking moles. Hubby came through on both accounts. Although I miss the sand and the surf all year long, I also miss the boardwalk. A mile each way, we walk it two or three times a day. This year Hubby only did it once, but I made sure I got my walk in each morning and afternoon and the night was a scattered walk. Stopping for fudge, lemon ice or coffee and finally Funland. Every now and then I wonder if we should go to another beach for a change, then I get to my beach and feel like I am home. Every year a few things change, this year my coffee shop ("Java Beach") was gone and is now a crab shack. But, all in all things pretty much stay the same. Hubby had his "Grottos" every day... yes, pizza, every day! And I had my ocean. I am good for another year, but next year we will be going a bit earlier in the summer. Looks amazing Anna. And you could try another beach but at another time of year. This one is your summer Love and keep it that way. BTW you look great in that picture. Sounds like a great place to vacation. I remember having tears in my eyes watching my daughter and her cousin on the dragon rollercoaster when they were younger. Such emotion, laughter and tears at the same time. I have the same love affair with "my" beach. I could never summer anyplace else. So glad you had such a wonderful time. You deserved it! Reading this post brought back childhood memories for me. Oh, nothing like the beach and the boardwalk! Oh that boy of yours sure is having a blast on that motorcycle! And that's a great picture of you, that beach of yours really becomes you! I think it's awesome taht you have such a place to go to filled with past memories and with lots of room for many more. How great! Especially since you have such wonderful memories of the place and now you can take your children there!